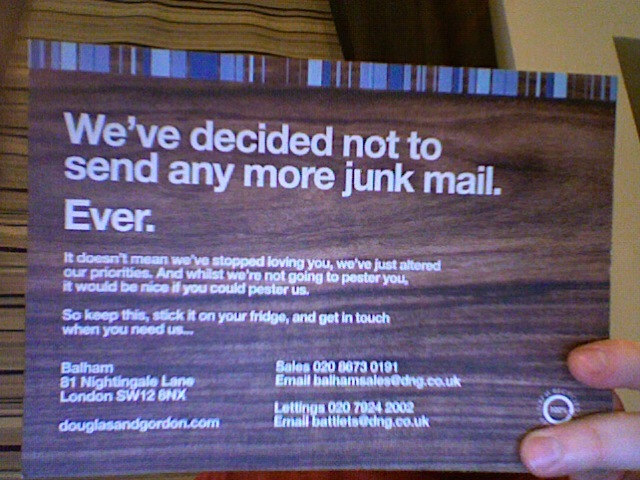 London estate agent Douglas & Gordon has stopped doing DM. And they've sent people one last thing to tell them so! Eye catching headline. And the copy on the back is nice too. Anyway, back to estate agents. They're the worst at bombarding us with crap, so I was impressed with the bravery here. 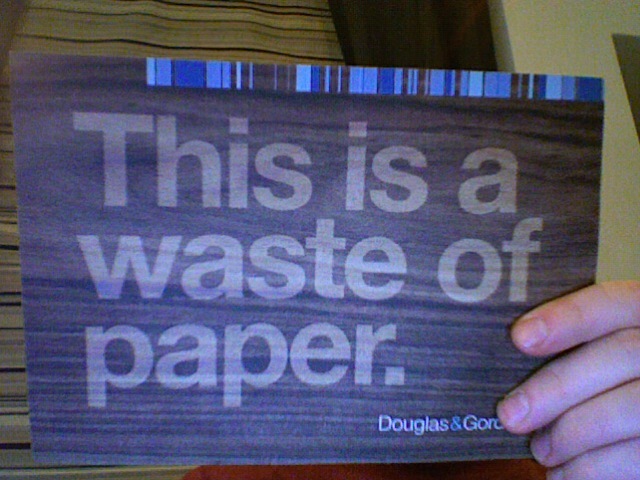 And obviously that means Douglas & Gordon come off as refreshing in the sector too. So I wanted to find the agency responsible, and started with the website. A simple banner took me to straight to something I thought was great. An open letter from the MD of D&G, Ivor Dickinson. Its a really nicely written piece that outlines his reasons for dispensing with DM. In fact its so well written I want to believe it actually was written by the MD. Cynical me - but I think most people wouldn't even question it. Think I'll email Ivor, point him in the direction of this post, and ask him who did the campaign. My search found several agencies that list them as clients,two of which - i-am and Phoenix - look likely candidates. Nice. Will be interesting to see if they stick to it though. Plus, I reckon Credit Card companies will be pretty peeved with your claim that estate agents are the 'worst' at bombarding people with crap. I think you'll find the agency to be rightfully acknowledged for the great creative is IF. (Ideas Factory, in Wimbledon).